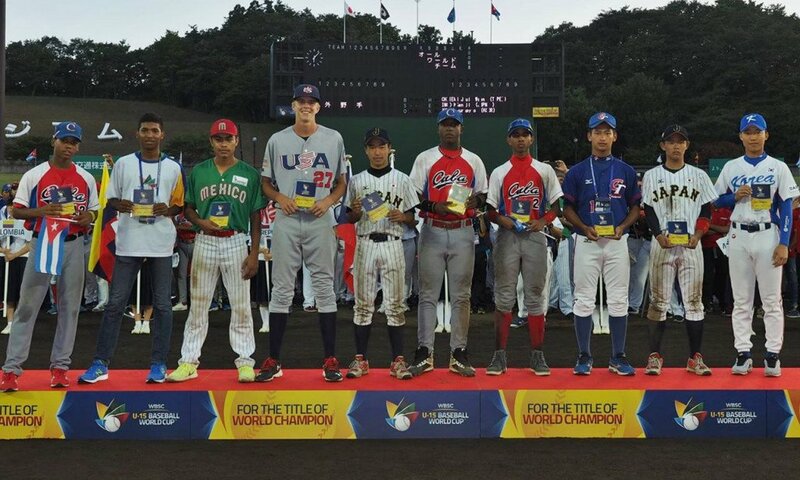 Ten players representing seven nations were selected on the All-World Team from the 2016 World Baseball Softball Confederation (WBSC) Under-15 Baseball World Cup in Iwaki, Japan. Cuba, winners of the competition in Iwaki, had three players named in the planet’s most elite Under-15 squad, while runners up Japan had two players nominated. Infielders included C Jared Guerrero of Mexico, American Justin Campbell, Yumeto Taguchi of Japan and Cuban duo Malcom Nunez and SS Daniel Castillo. The three outfielders that were chosen for the team were Jui Wen Chien of Chinese Taipei, Japan's Kenji Ino and Kyun-pyo Ko of South Korea. The pitching duties fell to Livian Chaviano of Cuba, with his relief pitcher in the form of Venezuela's Miguel Rondon. Cuba national team third baseman Malcom Nunez led all hitters in Iwaki, going 19-for-31, swiping a tournament-leading seven stolen bases in the process as well as creating several highlights with the glove. Second baseman Taguchi was named the Outstanding Defensive Player of the World Cup.Right fielder of the Japanese National Team Ino scored the most runs in Iwaki, 13, and hit the only home run to fly over the fence. In the competition, Cuba managed to successfully defend their WBSC Under-15 Baseball World Cup title, after beating hosts Japan in the final in Iwaki. Cuba all but put the final out of the host nation’s reach in the fourth innings, as they stretched their advantage to 8-0. Despite the support of the home fans, Japan proved unable to fight back into the match and eventually fell to a 9-4 defeat in Green Stadium. The victory continues Cuba’s excellent record in the tournament’s history. They have now triumphed on six occasions. The United States won the bronze medal as a result of a comfortable victory over Panama in the playoff.